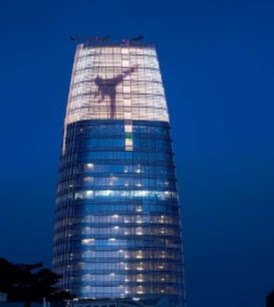 In San Francisco, Salesforce Tower is opening tonight. The lights will go on at the top of the tallest building west of the Mississippi this evening to display a permanent multi-million-dollar art installation by San Francisco artist Jim Campbell, reports the San Francisco Chronicle. A 15-minute fireworks display is also scheduled to explode from the top of the 61-story building on Mission St. at 8 pm.